Bod Australia (ASX: BDA) announced on Friday that one of its proprietary cannabis oil products is to be distributed through Chemist Warehouse. The arrangement is kicking off with MediCabilis, a pharmaceutical grade cannabidiol-based preparation, which is available under the Australian Therapeutic Goods Administration (TGA) Authorised Prescriber and Special Access Scheme Category B. Most Australians would be familiar with Chemist Warehouse, either its online presence or many bricks and mortar stores across the country. The Chemist Warehouse group employs thousands and is Australia’s largest pharmacy retailer. However, given the status of MediCabilis and cannabis medicines generally in Australia, access will be very limited and it won’t be just a matter of clicking to Chemist Warehouse’s web site and adding it to a shopping cart. Still, developments such as this help lend credibility to products of this nature and is certainly good news for Bod. “This is an exceptional development for Bod Australia. Chemist Warehouse Group is widely recognised as a market leader in the pharmacy sector and we are pleased to have aligned with them to dispense our cannabis products,” said Bod Australia CEO Jo Patterson. If you’re curious about the pricing of MediCabilis, at the time of publishing it wasn’t yet listed on the Chemist Warehouse web site and may not be for a while. The company says it is first initiating a training program for Chemist Warehouse Group pharmacists. It was only last month Bod Australia received its first prescription and required Special Access Scheme approvals for MediCabilis. The company says it is pursuing additional agreements with wholesalers and pharmacy groups to ensure medicinal cannabis is available to other approved pharmacies. The market responded favourably to the Chemist Warehouse news, with BDA shares closing the day on Friday up 7.14%. The company appears to be well-placed for other similar arrangements. Through its various other non-cannabis related products, Bod says it has secured access to over two thirds of the Australian pharmacy market through wholesaler agreements. 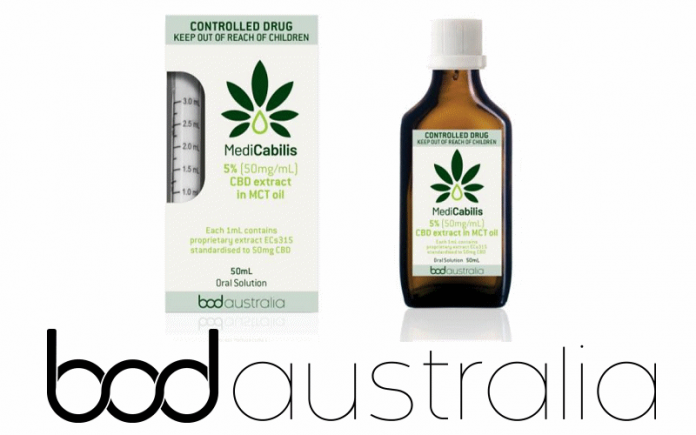 Bod Australia’s pharmaceutical grade cannabis extract ECs315 is also being used in other products under development. Last month Bod announced it had successfully dosed its ECs315 cannabis extract in a sublingual wafer. Next articleWhere To Now For Medical Marijuana In Missouri?